Glasgow is served by two airports, the primary of which is Glasgow International Airport (GLA). The second airport serving the city is Prestwick International Airport (PIK), located 51 km / 32 miles from the city centre. Both are within easy travelling distance of the city, by either train, coach or car. Major airlines at these airports offer the greatest number of departures, whereas smaller airlines, such as EasyJet, provide a reasonable selection of cheap no-frills European flights to major cities in France, Germany, the Netherlands and Spain. Glasgow International is situated just 14 km / 9 miles to the west of the city centre, 90 km / 56 miles from Edinburgh, and has good connections to the Edinburgh area. This important, busy Scottish airport deals with literally millions of passengers throughout the year, roughly 750,000 each month. Glasgow International Airport has two terminal buildings, with the main terminals comprising three piers - Central, West and East. The Central pier is for domestic flights and the West pier for international airlines, while the East pier is used by low-cost, Irish and Scottish Island's airlines. Glasgow Airport is situated to the north of the M8 motorway at junction 28, with good links to central Edinburgh. By car, the airport is around 15 minutes away from Glasgow, and just over one hour from Edinburgh city centre, with the route being well sign posted. Book your Glasgow Car Rental here. Regular buses are available and bus number 905 travels into Glasgow city centre, stopping at Central Station, Queen Street station and the Buchanan bus station. Bus and coach services also travel to Edinburgh and this is a convenient and economical way to reach the Scottish capital. Gilmour Street railway station is located in Paisley, just 3 km / 2 miles from Glasgow International Airport, and can be easily reached by both bus and taxi. Regular trains travel into central Edinburgh and this is one of the quickest ways to reach this destination. Taxis are readily available 24 hours a day, outside of the main terminal buildings, close to the arrivals areas. They provide a convenient and easy way to travel into nearby Glasgow, Edinburgh and other Scottish destinations. 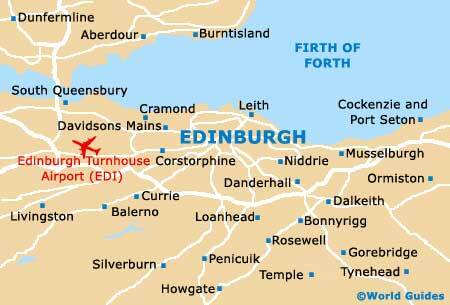 The journey from Glasgow Airport to central Edinburgh will take slightly longer than one hour, depending on traffic. It is worth checking with the driver if there are any extra charges, so that you are not surprised when you have to pay at the end of your journey.